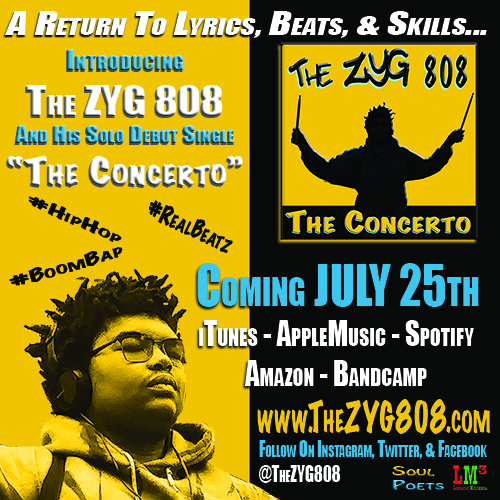 The concerto The ZYG 808 Introducing THE ZYG 808 and his solo debut single "The Concerto"
Introducing THE ZYG 808 and his solo debut single "The Concerto"
"The Concerto" is the debut solo single by hip-hop artist The ZYG 808, from his forthcoming album "The Intro". The ZYG 808 first came to national attention as a member of the Grammy nominated band, The GroovaLottos as well as his verse on the Soul Poet's Syndicate's track and music video "Flippin". An unapologetic Boom Bap Backpack artist, his lyrical content and style together with his knack for unusual song forms (The Concerto is in three distinct sections, with no bridge) sets him apart from most of the others in the game. '808' is a reference to the classic drum machine, and his unique ability to rap and play drums at the same time, astounding audiences up and down the east coast. At the age of 7, The ZYG 808 made his debut as a studio session player. By age 12, he was headlining the Boston Jazz Fest as a jazz fusion drummer. At age 13, he joined the multi-Grammy nominated band The GroovaLottos as a percussionist and featured MC. The ZYG 808 is definitely an upcoming artist to watch. The ZYG 808 is available for interviews and makes custom sound drops upon request.